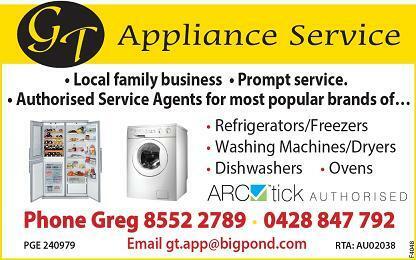 GT Appliance Service is your local fridge, washing machine, and dryer repairs and service specialist on the Fleurieu, based in Victor Harbor. 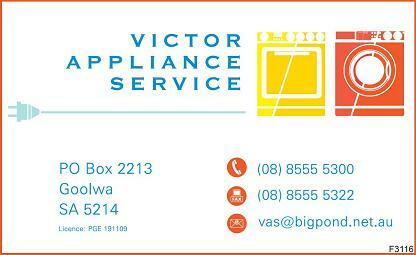 Victor Appliance Service is your local Fleurieu specialist for appliance repairs. If your washing machine won’t spin, your dishwasher won’t wash, your dryer won’t dry then it sounds like you need Victor Appliance Service. We pride ourselves on providing quality workmanship and service and operate throughout the Southern Fleurieu / South Coast from Goolwa to Victor Harbor and surrounding towns & districts. Give Matt & Lynette a call.